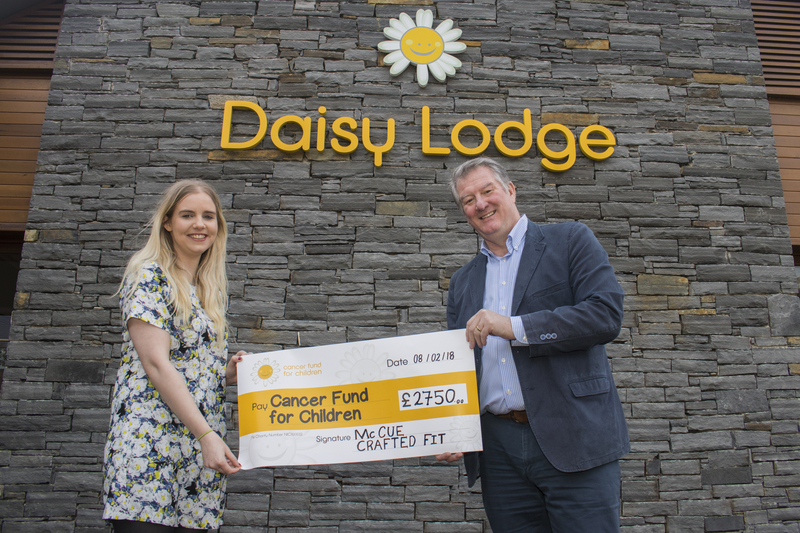 Fit out company, McCue is showing that its heart is as big as some of its most prestigious projects, with a generous donation including work in kind valuing over £10,000, to Cancer Fund for Children. McCue employees raised £2750 for the charity by partaking in a range of company fundraising events that included an abseil down the Europa Hotel, participation in the Belfast Marathon, fun day raffles and the famous ‘Christmas Jumper Day’. The company also pledged their expertise by assisting with the refurbishment of the Charity’s residential log cabin, Narnia, a haven for children and young people dealing with cancer, situated at the foothills of the Mourne Mountains in Newcastle, Co. Down. Through the work of Cancer Fund for Children, hundreds of children and young people affected by cancer in Northern Ireland have been able to enjoy a unique experience at Narnia for over 10 years. The kind-hearted gesture from McCue will see an update of the bathroom area themed in the charity’s bright colours, with partitioning and new cubicles also installed. If you would like to donate to Cancer Fund for Children or find out more about the work they do, visit www.cancerfundforchildren.com.